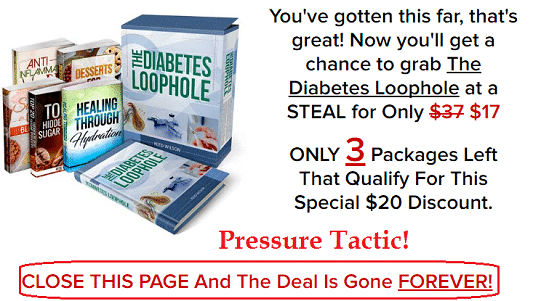 Diabetes Loophole by ‘Reed Wilson’ is a brand new scam you should stay away from. The people behind this highly deceptive scam are the same guys behind known scams Pure Natural Healing, Hard on Demand and NutriO2 so don’t believe anything you saw or heard about this product! Created in August 2016 (but just launched last week), Diabetes Loophole claims to be the ‘simple system’ that cures the root cause of Type 2 Diabetes. The root cause, according to Wilson, is chronic inflammation caused by cytokines. For those that do not know, cytokines are the chemical substances released by the body’s immune system to fight disease and other foreign bodies entering our cells. Their activity usually causes inflammation, which subsides once the offending disease/foreign body is neutralized. 1. ‘Reed Wilson’ Does NOT Exist! Reed Wilson calls himself ‘an alternative health researcher.’ Other than that, he never tells us how he qualified to become a researcher. Well don’t bother finding out, because he is just a stock photo you can buy at Shutterstock.com, Deposit Photos, 123RF.com etc.! If you really want to know who the real author of this product is, then head over to the affiliate page of Diabetes Loophole. There you’ll see the CEO of Success Vantage Group – the company behind this scam – explaining that the program was written by ‘a former Agora copywriter.’ He said the same thing over at Hard on Demand, a scam product targeting people with erectile dysfunction. ‘Doug’ is a photo stolen from Flickr. Just like in Pure Natural Healing, Diabetes Loophole is full of pop-ups preventing you from leaving. First, you are forced to read the text version if you do not have the patience to watch their long video. Try again to leave, and another pop up springs out. Then you are shown a ‘only 3 packages left’ countdown timer offering you a $20 discount on a $37 product. Try again to leave, and another pop-up springs out. Then you are shown a page urging you to enter your email to receive a report on how Big Pharma has conspired to ‘kill you’ with 3 diabetes drugs. That’s a lie. Actually, they want your email so that they’ll flood your inbox with spam messages urging you to try one product after another. Final Conclusion: DON’T BUY Diabetes Loophole. It is A SCAM! If you’ve made the mistake of buying this product, I recommend that you immediately contact Clickbank directly for a refund. Don’t bother contacting Diabetes Loophole support because you’ll never get your money back that way. Clickbank is your best option. Use this guide to get your refund. As always, feel free to use the comments if you have any contributions to make. Thank you! Thanks for the information . You just saved me from buying this product.. Its a shame that these scammers dupe people looking for relief from their problems. I started listening to this thinking it was from a youtube channel I subscribe to. Then I recognized this scam artist’s voice from another different solicitation I listened to about a year ago. I quickly zipped through it and realized there was virtually nothing being offered and proceeded to look up the name and the word “scam” Thank you. I was not going to buy it I was looking for somewhere to complain. This guy is worse than I thought with all his bogus photos and his style of stringing you along. I am sure Karma will catch up with this guy.